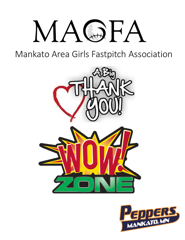 Aussie Peppers of Minnesota offer a LIMITED number of season passes to Mankato Peppers players and families. Only 100 Available until April 30th = $1.75 Per Game! Peppers players and family can purchase season tickets for entry to ALL Aussie Peppers games for as little as $1.75 per game via the season pass discount. Gate ticket prices will range from $10 - $14 per game. This season ticket offer is the BEST DEAL that will be offered all season!!! Watch the worlds best compete all summer at Caswell Park!! 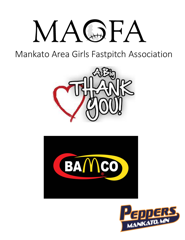 Including Aussie Peppers, Beijing Eagles, Canadian Wild, Cleveland Comets, Chicago Bandits, and USSSA Pride. Click on the link below then select the full retail season pass option of $85, and enter the promotion code earlypeppers to receive the $45 discount on each season pass purchased. Taxes and a small fee applies to each transaction. We are looking for additional board members. If you are not sure you want to be a board member but still want to help out, we are also looking for volunteers to help our committees with planning events, tournaments, tryouts, etc. WANT TO EARN $$$ ON THE FIELD? How would you like to get paid watching the game that you love? Join us this Spring/Summer as an Umpire! Training is provided. Do you have a passion for coaching? Please follow the link below for more details! Looking for camps and clinics to attend?! Click here! 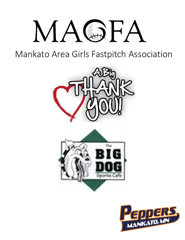 ALL PROFITS WILL GO TOWARDS FIELD AND FACILITY IMPROVEMENTS FOR MAGFA SOFTBALL. 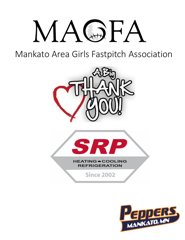 Support Mankato Peppers by purchasing something you need weekly…gas for your vehicle. 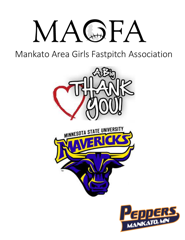 M.A.G.F.A. 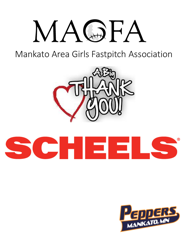 has partnered with Kwik Trip to offer gas/gift cards. Purchase in denominations of $25, $50 or $100. Keep one in your car for emergencies. Use them to fill up for traveling to tournament and league games. You get 100% of the value you pay for (Buy $100, get $100 in gas!) and a percentage of the receipts go back to M.A.G.F.A. from Kwik Trip. 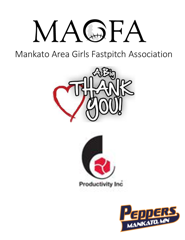 This is a long term rewards program that we will be offering to our players families and supporters as a way to continue to improve girls fastpitch softball in Mankato.Thank you for supporting the Mankato Peppers softball program! Andring, Collins & Norman & Co. Chtd. 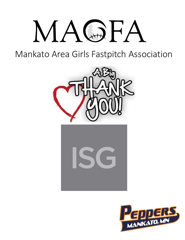 MAGFA will cancel games when the heat index reaches 105º (for reference, the MN State High School League uses 115º as their threshold). The National Weather Service reading at 3:00PM will be used for determining cancelations. 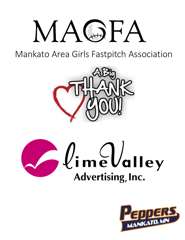 Know someone who likes to volunteer and help out local programs? 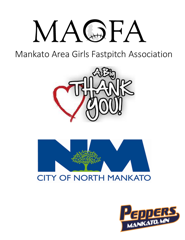 We are looking for volunteers willing to share their passion for softball with Mankato youth as coaches, team managers and event volunteers. Contact us at mankatopeppers@yahoo.com or click on the link above to learn more.